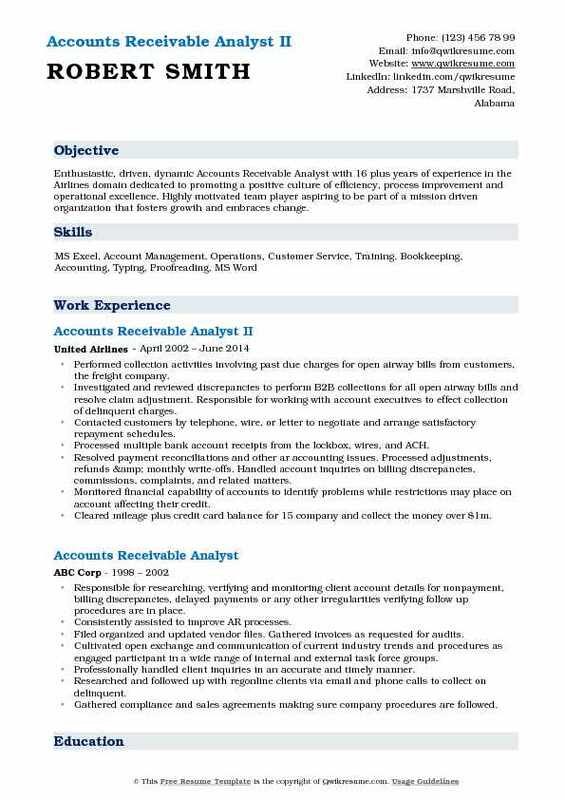 An Accounts Receivable Analyst Resume is responsible for managing all accounts receivable tasks. 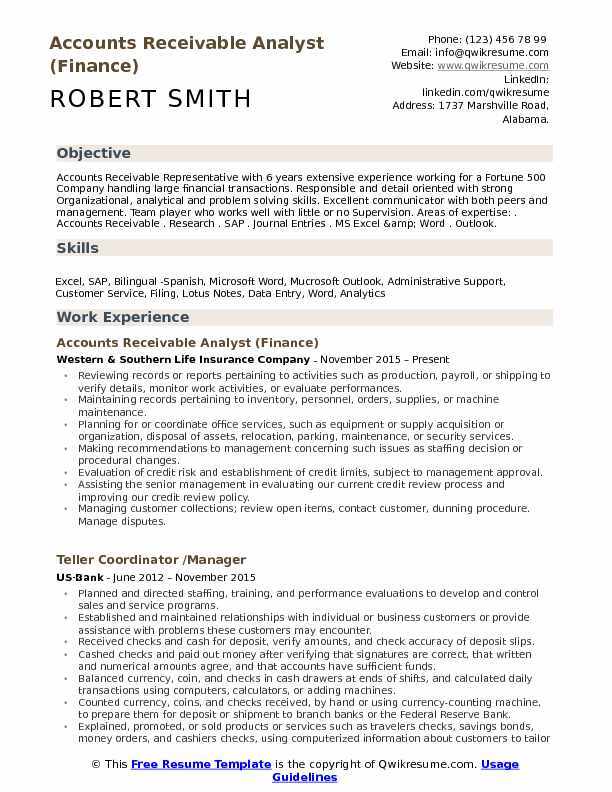 An Accounts Receivable Resume should highlight duties like proper management of accounts receivable accounts, responding to internal and external inquiries for accounts receivable accounts, analyzing accounts receivable accounts and other reconciling procedures. 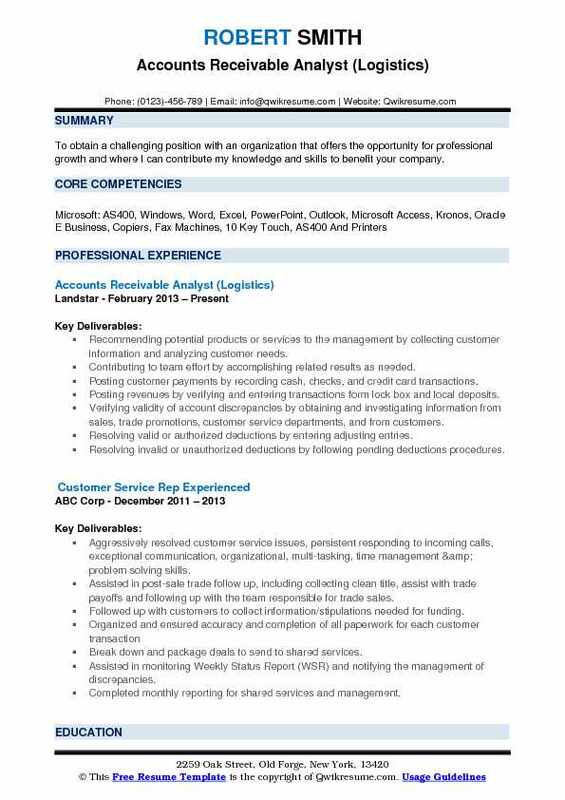 The job description template also mentions responsibilities like monitoring issues in accounts receivable accounts and providing solutions, performing credit checks for new as well as existing customer’s accounts and assigning limits to it, analyzing any risks related to customer accounts and abiding by all internal policies and procedures of the company. The skills required for this job role are Peoplesoft or ERP experience, accounts receivable experience, project management skills, strong analytical, organizational and communication skills and leadership skills. The educational qualification needed is bachelors in accounting or equivalent and proficiency in Microsoft office. 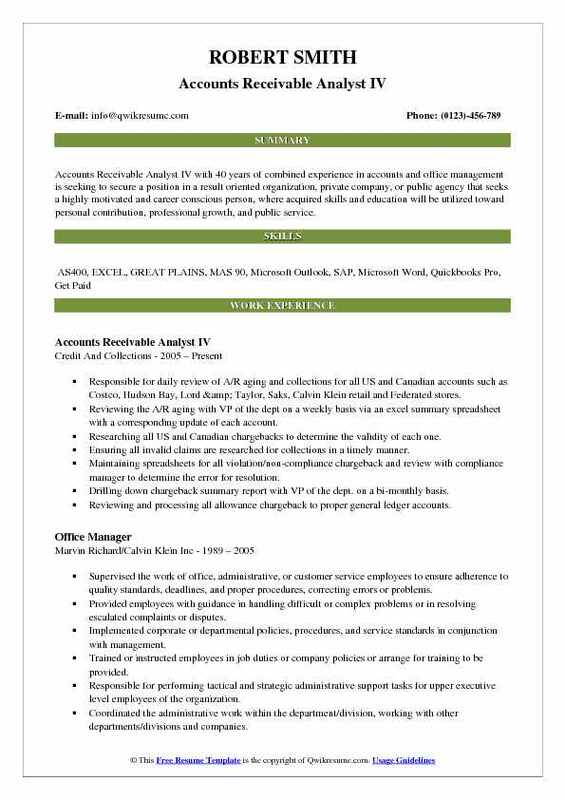 Headline : A Detailed oriented, fast adapting Accounts Receivable Analyst is seeking a challenging position with room for growth. Key strengths include excellence in time management, scheduling, communication, organization, and skillful with Microsoft Office, SAP, and Sage Accepac. Ensuring prompt and accurate billing of royalty accounting and administrative fees. Daily cash posting of checks and wires, update cash reports and distribute to management. Extensive AS/400 and excel analysis to accurately update numerous collections reports. Liaising with finance department regarding reconciliation and variances. Maintaining assigned accounts on collections call sheet to maximize monthly royalty payments and meet budget set by management. Preparing analyses to illustrate key performance indicators for the ar function and comparison reporting (i.e., total receipts versus budget). Resolving publisher initiated issues swiftly, accurately and effectively including matters when follow-up with other departments is required. Escalating accounts to management as required by departmental a/r procedure. Conducting a thorough research and analyze current processes to aid in the speedy resolution of cash discrepancies, misapplications and royalty reporting issues. Researching publisher inquiries for missing payments and/or correct royalty reporting. Contacting the delinquent customers to secure payment administering all collections according to required policies and procedures. 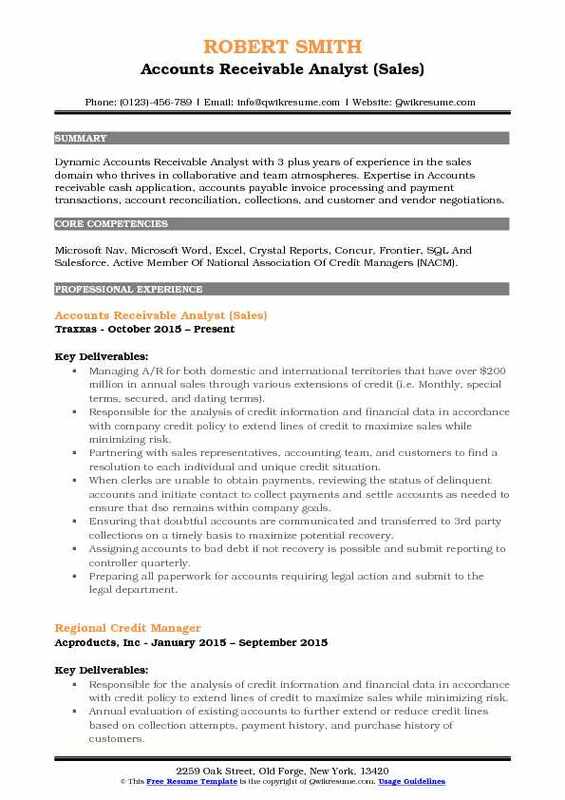 Summary : Seasoned Accounts Receivable Analyst with 17+ years of business experience and knowledge within a large organization. Proficient problem-solver who envisions business perspectives to develop workable solutions. 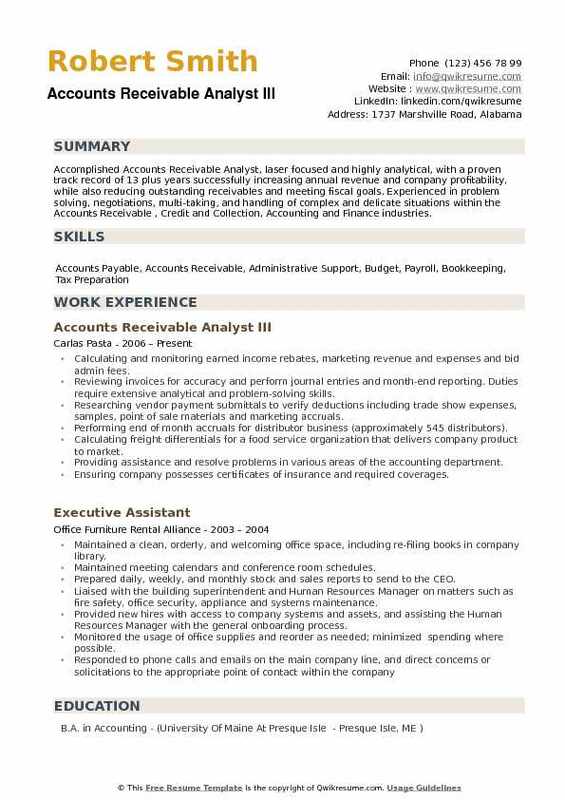 Accomplished, results-focused self-starter with a strong work ethic. Excellent inter-personal and communication skills. Demonstrates exceptional versatility as shown by ability to learn quickly and manage multiple tasks simultaneously. Directly responsible for analyzing and rectifying all billing discrepancies while verifying payments have been received and posted correctly for client invoices. Evaluated and researched outstanding issues for escalation to the appropriate department in a timely manner, with follow up to ensure concerns are resolved. Communicated and worked closely with all operational groups to uphold company policies and procedures. Performed analysis and strategic management in support of client agreements and accounting best practices. Collaborated with clients, preparing and organizing necessary documentation for efficient and timely payments. Evaluated and researched root cause issues securing all background material to provide proficient write-ups/reports including a resolution to upper management. Oversaw the collection activities in conjunction with the billing department to amend any invoicing errors and establish procedures to avoid invoice rejections. Managed the billing, collection and reporting activities within or exceeding company metrics, goals and deadlines. Operated and administered multiple third-party systems (LPs invoice management, Lenstar, etc. ). Executed daily/weekly departmental reports including trending, accuracy, and progression for the ar manager to monitor department workflow. Summary : Accounts receivable analyst with over 24 plus years of credit and collections experience for commercial accounts and collected approximately $3 million on portfolio monthly. 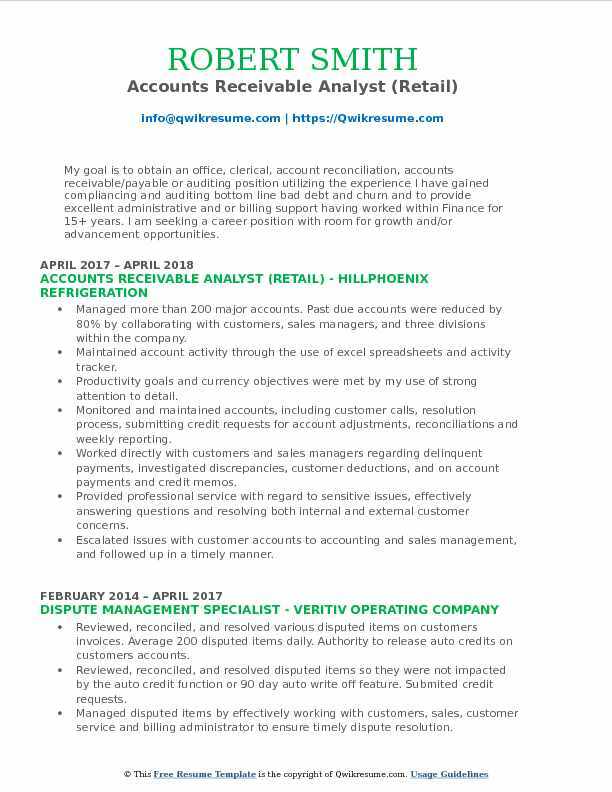 Extensive experience with global accounts, reducing DSO (days sales outstanding), and managing a portfolio of 1,000 - over 5,000 accounts throughout my careers. Collect more than $1 - $2 million weekly and received cash/checks from lockboxes and wire payments (Bank of America, PNC, Citizens and Key bank) on a daily basis. Responsible for managing all collection related activities for an established range of CKE restaurant franchisees while utilizing superior customer service, negotiation and conflict resolution skills. Working independently, perform day to day management of assigned accounts by contacting franchisees direct for payment against advertising & royalty fees, monthly rent and equipment sales in accordance with established. Reconciling and resolving discrepancies related to billing, pricing, tax and payment application with the assistance of other internal cke departments to achieve a timely collection of outstanding accounts receivable. Preparing past due aging reports and set up payment schedules required for a specific set of franchisees. Documenting all disputes and file internal claims received from the franchise community. Coordinating payment schedules for all new equipment purchase agreements along the collection of installment. Processing and post payments to franchisee accounts that include checks, wire and ACH transfers in addition to credit card transactions. Reviewing franchise equipment orders and restrict if necessary until delinquencies are resolved. Handling all requests for copies of invoices, statements and other relevant documentation as needed. Preparing accounts receivable reports for submission to management with account status as needed. 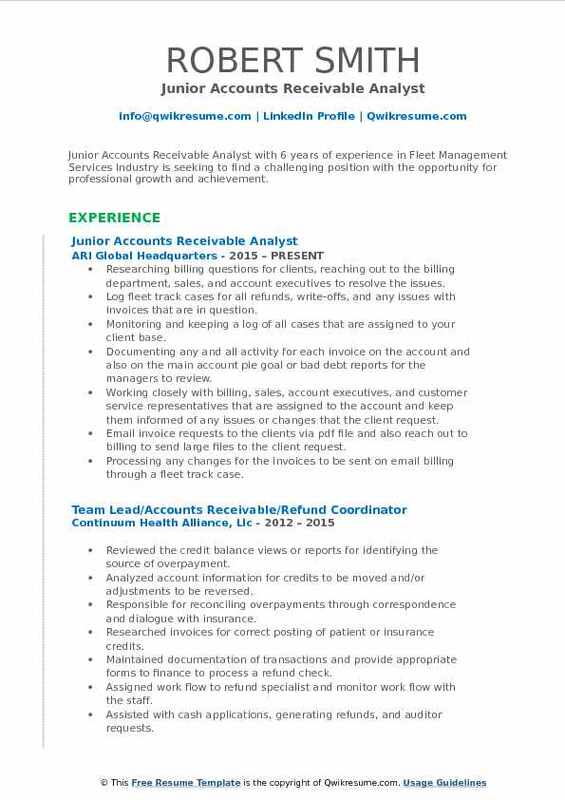 Headline : Junior Accounts Receivable Analyst with 6 years of experience in Fleet Management Services Industry is seeking to find a challenging position with the opportunity for professional growth and achievement. Researching billing questions for clients, reaching out to the billing department, sales, and account executives to resolve the issues. Log fleet track cases for all refunds, write-offs, and any issues with invoices that are in question. Monitoring and keeping a log of all cases that are assigned to your client base. Documenting any and all activity for each invoice on the account and also on the main account pie goal or bad debt reports for the managers to review. Working closely with billing, sales, account executives, and customer service representatives that are assigned to the account and keep them informed of any issues or changes that the client request. Email invoice requests to the clients via pdf file and also reach out to billing to send large files to the client request. Processing any changes for the invoices to be sent on email billing through a fleet track case. Reaching out to clients for remittances for the cash application department. Working closely with the cash application department to approve short pay invoices. Attending the weekly meetings scheduled to discuss clients with outstanding balances along with any issues that cause a delay in payments. 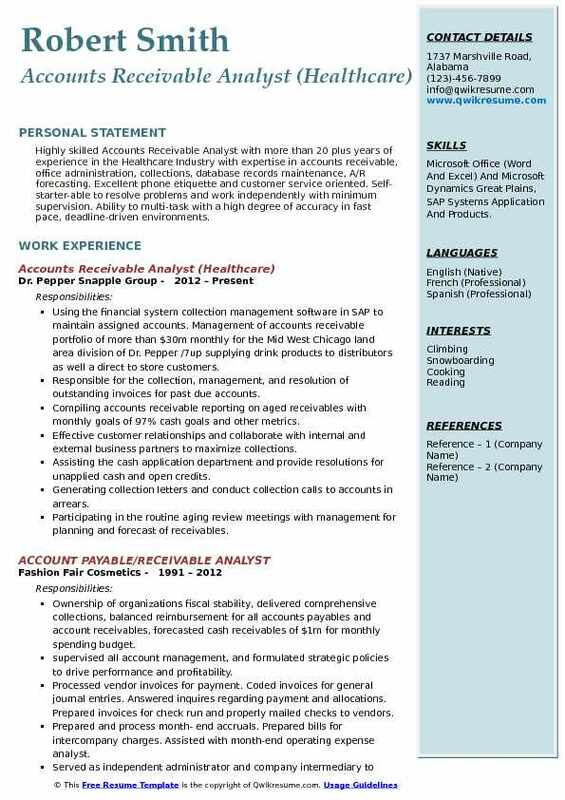 Summary : Highly skilled Accounts Receivable Analyst with more than 20 plus years of experience in the Healthcare Industry with expertise in accounts receivable, office administration, collections, database records maintenance, A/R forecasting. Excellent phone etiquette and customer service oriented. Self-starter-able to resolve problems and work independently with minimum supervision. Ability to multi-task with a high degree of accuracy in fast pace, deadline-driven environments. 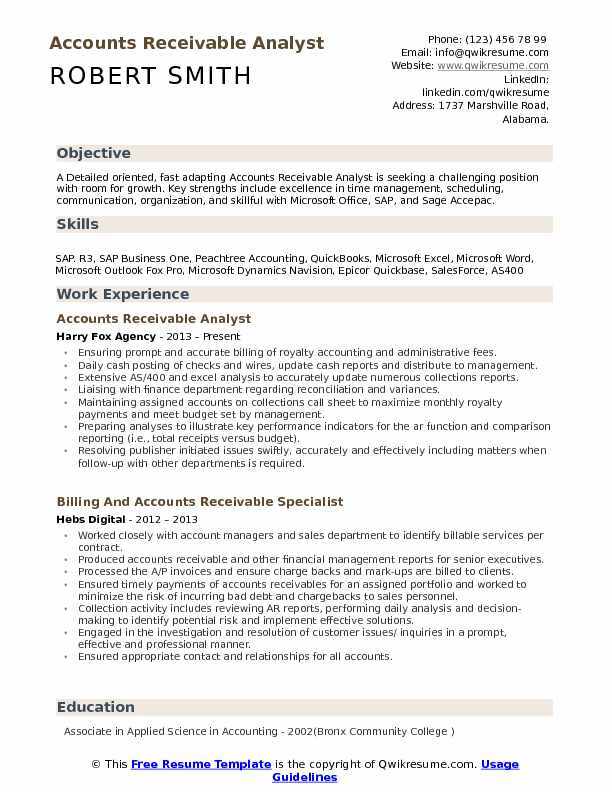 Skills : Microsoft Office (Word And Excel) And Microsoft Dynamics Great Plains, SAP Systems Application And Products. Using the financial system collection management software in SAP to maintain assigned accounts. Management of accounts receivable portfolio of more than $30m monthly for the Mid West Chicago land area division of Dr. Pepper /7up supplying drink products to distributors as well a direct to store customers. Responsible for the collection, management, and resolution of outstanding invoices for past due accounts. Compiling accounts receivable reporting on aged receivables with monthly goals of 97% cash goals and other metrics. Effective customer relationships and collaborate with internal and external business partners to maximize collections. Assisting the cash application department and provide resolutions for unapplied cash and open credits. Generating collection letters and conduct collection calls to accounts in arrears. Participating in the routine aging review meetings with management for planning and forecast of receivables. Providing account receivable reconciliations as needed in the form of monthly statements, bill of landing and invoice copies as requested from customers. Assessing the credit risk of potential and existing clients. Suspension of delivery to diligent accounts. Monitoring the established customer credit limits and payment terms. Identify accounts requiring collection agency or legal action. Maintaining records of collection efforts and current status of open invoices for use in establishing monthly bad debt reserves. Summary : Enthusiastic, driven, dynamic Accounts Receivable Analyst with 16 plus years of experience in the Airlines domain dedicated to promoting a positive culture of efficiency, process improvement and operational excellence. Highly motivated team player aspiring to be part of a mission driven organization that fosters growth and embraces change. Performed collection activities involving past due charges for open airway bills from customers, the freight company. Investigated and reviewed discrepancies to perform B2B collections for all open airway bills and resolve claim adjustment. Responsible for working with account executives to effect collection of delinquent charges. Contacted customers by telephone, wire, or letter to negotiate and arrange satisfactory repayment schedules. Processed multiple bank account receipts from the lockbox, wires, and ACH. Resolved payment reconciliations and other ar accounting issues. Processed adjustments, refunds & monthly write-offs. Handled account inquiries on billing discrepancies, commissions, complaints, and related matters. Monitored financial capability of accounts to identify problems while restrictions may place on account affecting their credit. Cleared mileage plus credit card balance for 15 company and collect the money over $1m. Monitored customer accounts in SAP 6.0 and contacting customers with any issues. 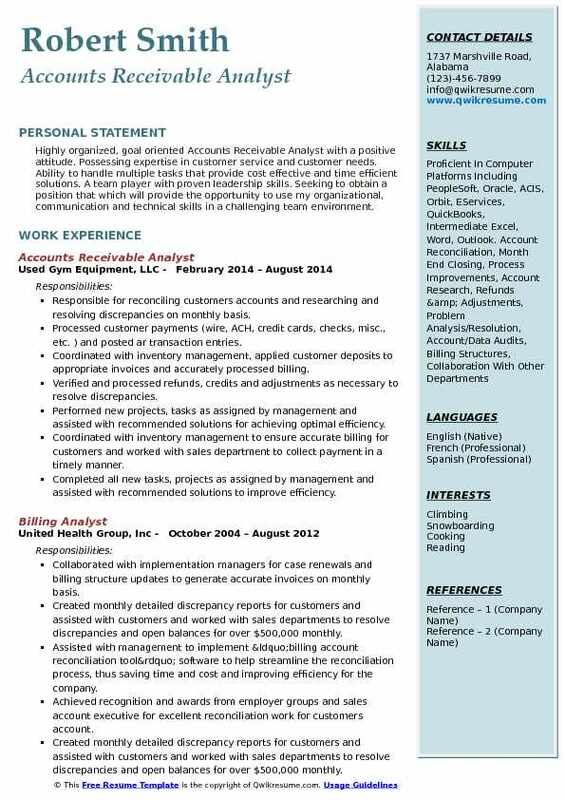 Objective : My goal is to obtain an office, clerical, account reconciliation, accounts receivable/payable or auditing position utilizing the experience I have gained compliancing and auditing bottom line bad debt and churn and to provide excellent administrative and or billing support having worked within Finance for 15+ years. I am seeking a career position with room for growth and/or advancement opportunities. Managed more than 200 major accounts. Past due accounts were reduced by 80% by collaborating with customers, sales managers, and three divisions within the company. Maintained account activity through the use of excel spreadsheets and activity tracker. Productivity goals and currency objectives were met by my use of strong attention to detail. Monitored and maintained accounts, including customer calls, resolution process, submitting credit requests for account adjustments, reconciliations and weekly reporting. Worked directly with customers and sales managers regarding delinquent payments, investigated discrepancies, customer deductions, and on account payments and credit memos. Provided professional service with regard to sensitive issues, effectively answering questions and resolving both internal and external customer concerns. Escalated issues with customer accounts to accounting and sales management, and followed up in a timely manner. Participated in weekly management meetings to discuss past due accounts. Submitted invoices in the customer portal or sent as requested by the customer. Received a customer service award and was recognized by Dover on my customer service skills. Objective : Dynamic Accounts Receivable Analyst with 3 plus years of experience in the sales domain who thrives in collaborative and team atmospheres. Expertise in Accounts receivable cash application, accounts payable invoice processing and payment transactions, account reconciliation, collections, and customer and vendor negotiations. Skills : Microsoft Nav, Microsoft Word, Excel, Crystal Reports, Concur, Frontier, SQL And Salesforce. Active Member Of National Association Of Credit Managers (NACM). Managing A/R for both domestic and international territories that have over $200 million in annual sales through various extensions of credit (i.e. Monthly, special terms, secured, and dating terms). Responsible for the analysis of credit information and financial data in accordance with company credit policy to extend lines of credit to maximize sales while minimizing risk. Partnering with sales representatives, accounting team, and customers to find a resolution to each individual and unique credit situation. When clerks are unable to obtain payments, reviewing the status of delinquent accounts and initiate contact to collect payments and settle accounts as needed to ensure that dso remains within company goals. Ensuring that doubtful accounts are communicated and transferred to 3rd party collections on a timely basis to maximize potential recovery. Assigning accounts to bad debt if not recovery is possible and submit reporting to controller quarterly. Preparing all paperwork for accounts requiring legal action and submit to the legal department. Generating weekly aging reports and weekly cash flow forecasts for management. Generating monthly, quarterly and annual sales trends on customers within the portfolios for management review. Reviewing of customer credit limits and terms as necessary to ensure they remain properly assigned. 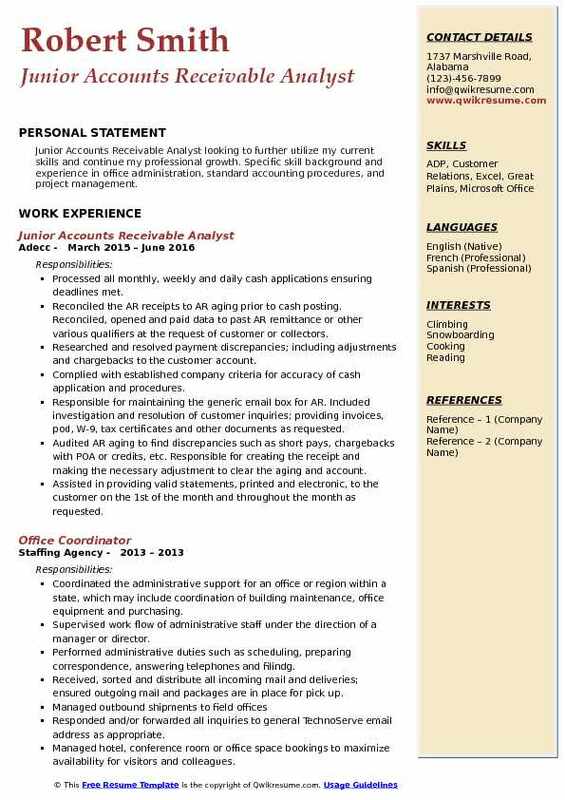 Objective : Junior Accounts Receivable Analyst looking to further utilize my current skills and continue my professional growth. Specific skill background and experience in office administration, standard accounting procedures, and project management. Processed all monthly, weekly and daily cash applications ensuring deadlines met. Reconciled the AR receipts to AR aging prior to cash posting. Reconciled, opened and paid data to past AR remittance or other various qualifiers at the request of customer or collectors. Researched and resolved payment discrepancies; including adjustments and chargebacks to the customer account. Complied with established company criteria for accuracy of cash application and procedures. Responsible for maintaining the generic email box for AR. Included investigation and resolution of customer inquiries; providing invoices, pod, W-9, tax certificates and other documents as requested. Audited AR aging to find discrepancies such as short pays, chargebacks with POA or credits, etc. Responsible for creating the receipt and making the necessary adjustment to clear the aging and account. Assisted in providing valid statements, printed and electronic, to the customer on the 1st of the month and throughout the month as requested. Provided daily Ad hoc reports to management and reviewed other Ad hoc reports and performed analysis as requested. Assigned projects in addition to daily task to complete specific deadlines. 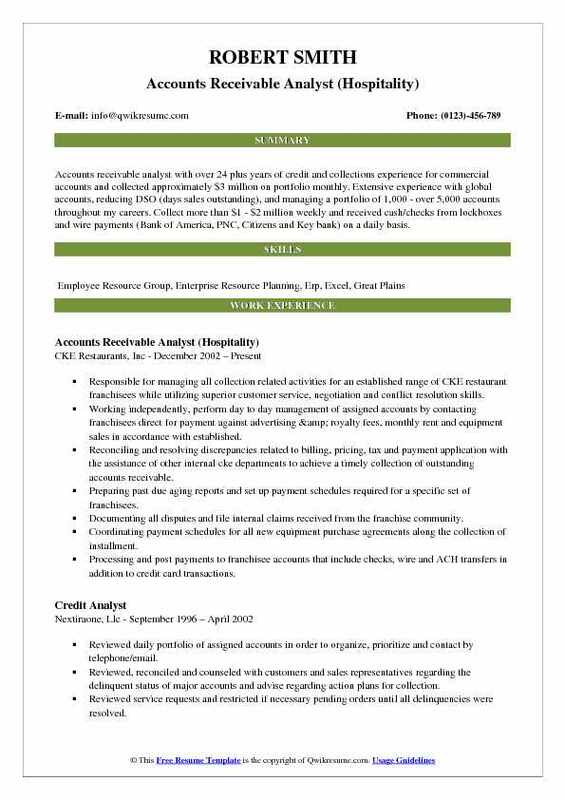 Summary : Accomplished Accounts Receivable Analyst, laser focused and highly analytical, with a proven track record of 13 plus years successfully increasing annual revenue and company profitability, while also reducing outstanding receivables and meeting fiscal goals. Experienced in problem solving, negotiations, multi-taking, and handling of complex and delicate situations within the Accounts Receivable , Credit and Collection, Accounting and Finance industries. Calculating and monitoring earned income rebates, marketing revenue and expenses and bid admin fees. Reviewing invoices for accuracy and perform journal entries and month-end reporting. Duties require extensive analytical and problem-solving skills. Researching vendor payment submittals to verify deductions including trade show expenses, samples, point of sale materials and marketing accruals. Performing end of month accruals for distributor business (approximately 545 distributors). Calculating freight differentials for a food service organization that delivers company product to market. Providing assistance and resolve problems in various areas of the accounting department. Ensuring company possesses certificates of insurance and required coverages. Assisting with company participation in trade shows including floor plan layouts, booth location, lighting and product set-up. Applying lockbox deposits and cash receipts daily and post transactions to the proper general ledger account. Researching and resolving deductions, classifying them to the appropriate general ledger account. 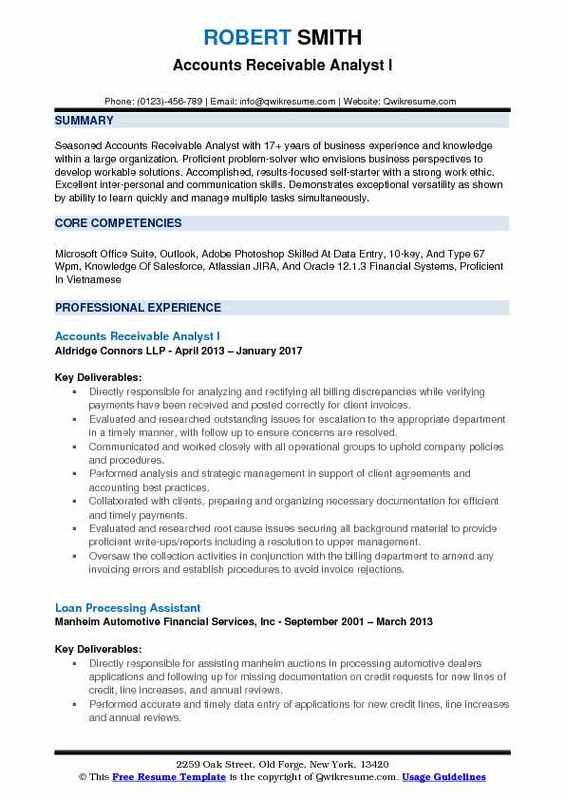 Headline : Accounts Receivable Representative with 6 years extensive experience working for a Fortune 500 Company handling large financial transactions. Responsible and detail oriented with strong Organizational, analytical and problem solving skills. Excellent communicator with both peers and management. Team player who works well with little or no Supervision. Areas of expertise: . Accounts Receivable . Research . SAP . Journal Entries . MS Excel & Word . Outlook. Reviewing records or reports pertaining to activities such as production, payroll, or shipping to verify details, monitor work activities, or evaluate performances. Maintaining records pertaining to inventory, personnel, orders, supplies, or machine maintenance. Planning for or coordinate office services, such as equipment or supply acquisition or organization, disposal of assets, relocation, parking, maintenance, or security services. Making recommendations to management concerning such issues as staffing decision or procedural changes. Evaluation of credit risk and establishment of credit limits, subject to management approval. Assisting the senior management in evaluating our current credit review process and improving our credit review policy. Managing customer collections; review open items, contact customer, dunning procedure. Manage disputes. Identifying and analyzing accounts to discover discrepancies and resolve all variances promptly. Maintaining communications with local executives and regional leadership for monthly reporting. Supporting global control standards for bi-annual internal audits and implement actions plans for ineffective processes. Headline : To obtain a challenging position with an organization that offers the opportunity for professional growth and where I can contribute my knowledge and skills to benefit your company. Recommending potential products or services to the management by collecting customer information and analyzing customer needs. Verifying validity of account discrepancies by obtaining and investigating information from sales, trade promotions, customer service departments, and from customers. Summarizing receivables by maintaining invoice accounts; coordinating monthly transfer to accounts receivable account; verifying totals and preparing the report. Summary : Accounts Receivable Analyst IV with 40 years of combined experience in accounts and office management is seeking to secure a position in a result oriented organization, private company, or public agency that seeks a highly motivated and career conscious person, where acquired skills and education will be utilized toward personal contribution, professional growth, and public service. Responsible for daily review of A/R aging and collections for all US and Canadian accounts such as Costco, Hudson Bay, Lord & Taylor, Saks, Calvin Klein retail and Federated stores. Reviewing the A/R aging with VP of the dept on a weekly basis via an excel summary spreadsheet with a corresponding update of each account. Researching all US and Canadian chargebacks to determine the validity of each one. Ensuring all invalid claims are researched for collections in a timely manner. Maintaining spreadsheets for all violation/non-compliance chargeback and review with compliance manager to determine the error for resolution. Drilling down chargeback summary report with VP of the dept. on a bi-monthly basis. Reviewing and processing all allowance chargeback to proper general ledger accounts. Reviewing the corresponding customer profile for changes to verify terms and discounts. Objective : Precise, detail-oriented Entry Level Accounts Receivable Analyst with sound judgment and decision-making skills. Experienced in A/R processes, and skill in working with customers and management. Highlights Strong communication skills Effective time management Complex problem solving Accounting operations professional Expert in customer relations. Provided financial, administrative and clerical services to maintain the effective, efficient and accurate. Financial and administrative accounts receivable operations in accordance with established company accounting policies and procedures. Coded and posted cash receipts into mas90 within 24 hours of deposit. Researched and applied unallocated cash, and performed due diligence and assessed risk on past due accounts. Researched and resolved charge-back disputes placed by customers due to erroneous freight. Negotiate payment programs with delinquent customers, within company guidelines. Completed a thorough credit analysis on new customers, including trade references, banking. Monitored the business flow of over 100 customers through net sales. Prioritized the workflow to assure all areas are completed in a timely and accurate manner. 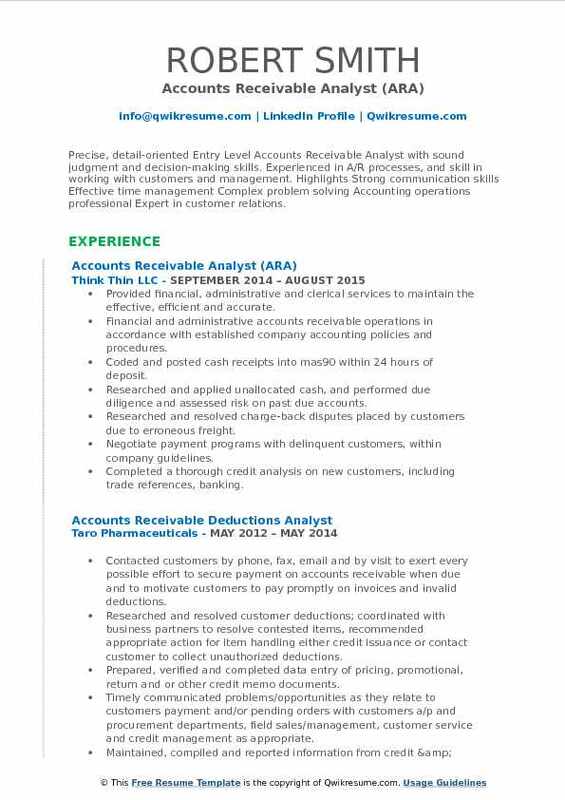 Summary : Highly organized, goal oriented Accounts Receivable Analyst with a positive attitude. Possessing expertise in customer service and customer needs. Ability to handle multiple tasks that provide cost effective and time efficient solutions. A team player with proven leadership skills. Seeking to obtain a position that which will provide the opportunity to use my organizational, communication and technical skills in a challenging team environment. Responsible for reconciling customers accounts and researching and resolving discrepancies on monthly basis. Processed customer payments (wire, ACH, credit cards, checks, misc., etc. ) and posted ar transaction entries. Coordinated with inventory management, applied customer deposits to appropriate invoices and accurately processed billing. Verified and processed refunds, credits and adjustments as necessary to resolve discrepancies. Performed new projects, tasks as assigned by management and assisted with recommended solutions for achieving optimal efficiency. Coordinated with inventory management to ensure accurate billing for customers and worked with sales department to collect payment in a timely manner. Completed all new tasks, projects as assigned by management and assisted with recommended solutions to improve efficiency. Account reconciliation, account research, account/data audits, refunds & adjustments, billing structures, process improvements, collaboration with other departments. Responsible for reconciling cash payments within 30 days and efficiently processing cash applications (received over $8 million each month).